Talus, a leading fintech payment solution provider to 25,000+ small and medium sized business clients across the U.S., today announced the completion of its acquisition of Scottsdale-based Prolific Business Solutions. The Strawhecker Group acted as portfolio advisors, and Winston & Strawn LLP as legal advisors to Talus. May Potenza Baran & Gillespie acted as legal advisers to Prolific Business Solutions. 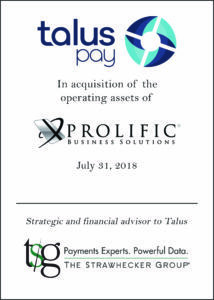 Talus, a portfolio company of Alvarez & Marsal Capital Partners (AMCP), has now completed three payment technology and portfolio acquisitions over the prior 18 months, and has committed an additional $250 million of acquisition capital behind Talus CEO, Scott Cruickshank, and his management team. “We are proud and excited to continue our partnership with Talus. Led by Scott, this group of senior fintech thought leaders at Talus have built an impeccable reputation centered on technology driven payment solutions for merchants across attractive industry verticals,” said Mike Odrich, Senior Managing Director and Co-Founder of A&M Capital.